Comments: Deciduous broadleaf native to central and south Asia. Yellow green leaves 2" long with sharp apex, white to pink flowers in late Winter or early Spring. 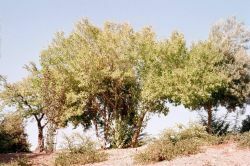 Trees are very drought tolerant and are common in the local hills. Father Junipero Serra brought seeds to plant at the Missions, but later nursery men were the founders of the California Almond Industry.